Like most of the races I’ve participated in, the 2014 US Bank OC Marathon/Half Marathon started with a health expo. This one even had a sponsor. 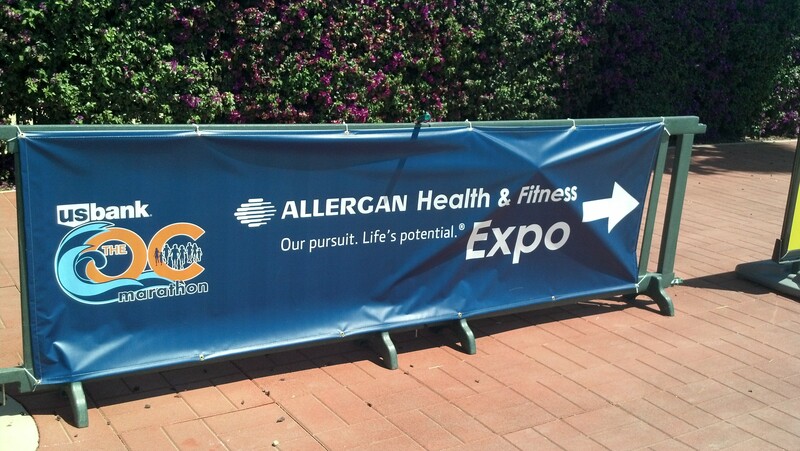 It was officially called the Allergan Health & Fitness Expo. The Expo ran on Friday evening and all day Saturday. Since I get off from work too late to make it down to Orange County by the time the expo would be closing, I decided that I’d go on Saturday morning to get my race bib and race shirt. After all, there were no race day check in’s allowed. 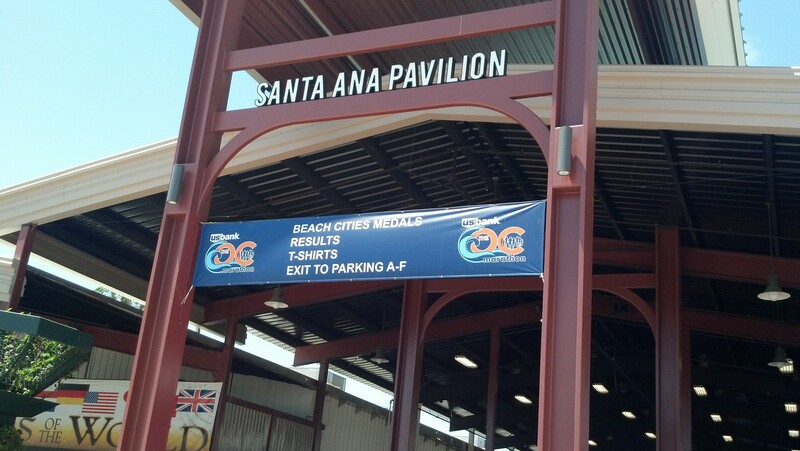 Getting to the Orange County Fair Grounds (where the Allergan Health & Fitness Expo was staged) wasn’t a problem. I encountered minimal traffic and the signs from the freeway all the way into the parking lot made it pretty easy to find. It didn’t take long to get parked. Even though I thought it sucked that I had to pay $7 to park at the expo, you’ve got to do what the race organizers have set up. On the way to the expo, I noticed that there were a lot of kids coming out to the parking lot with their finishers medals. Apparently, the kids races were held at the OC Fair Grounds on Saturday and I ended up arriving just as the races were finishing. There were plenty of signs out to help me find where I was to go for the Expo. So, it was easy enough to find where I needed to be. The first stop was to get my race bib. I thought that the flow of the Expo was great. There were a lot of people who arrived at the same time as me. 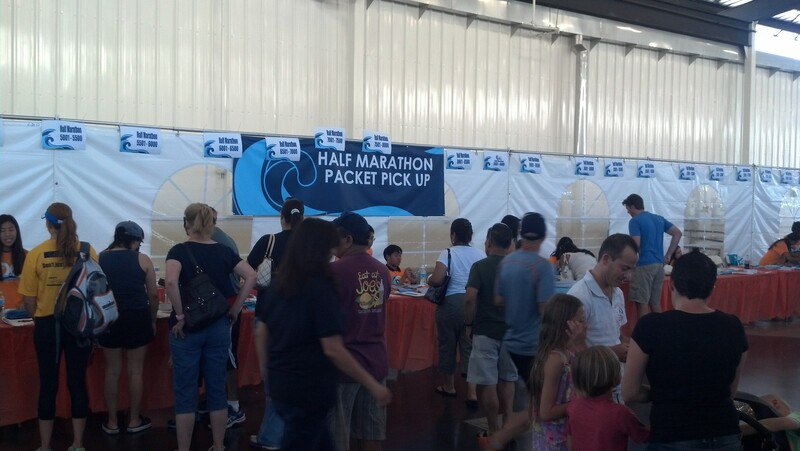 As you can see, the lines to get the half marathon race packets were small. I walked right up to my line and got my race bib quickly. The next area in the flow of the Expo was the official merchandise. I was very underwhelmed with the selection of merch for this race. In some of my previous races, I wished that I had planned on buying merchandise because there were some very tempting items. 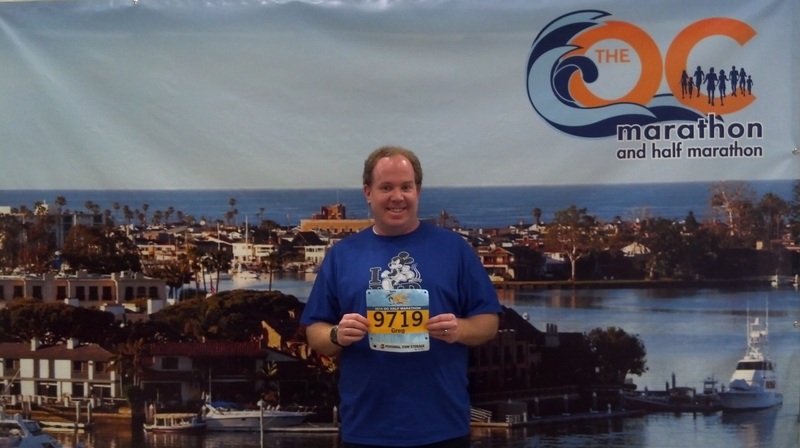 With the OC Half Marathon, I wasn’t tempted by anything. I’m sure that others were. It just wasn’t for me. I also noticed that a large portion of the race merchandise was geared towards women. So, maybe that’s why I wasn’t as interested. 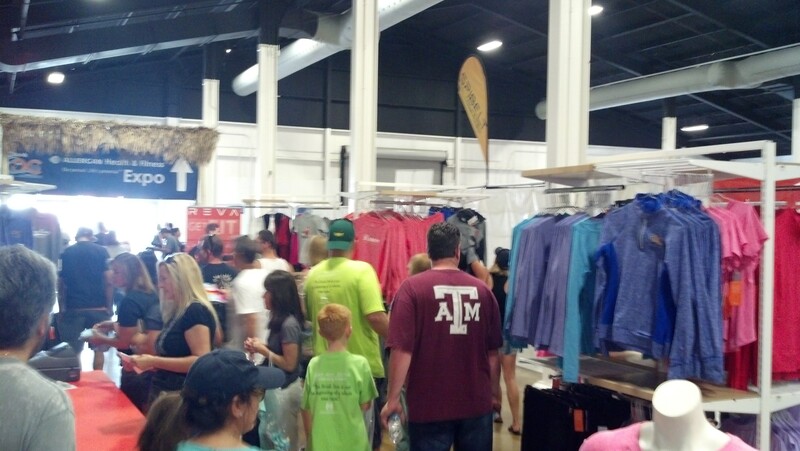 Once you left the official race merchandise area, you came to where you’d pick up your race shirt. Again, the line was non-existent and I got my shirt very quickly. 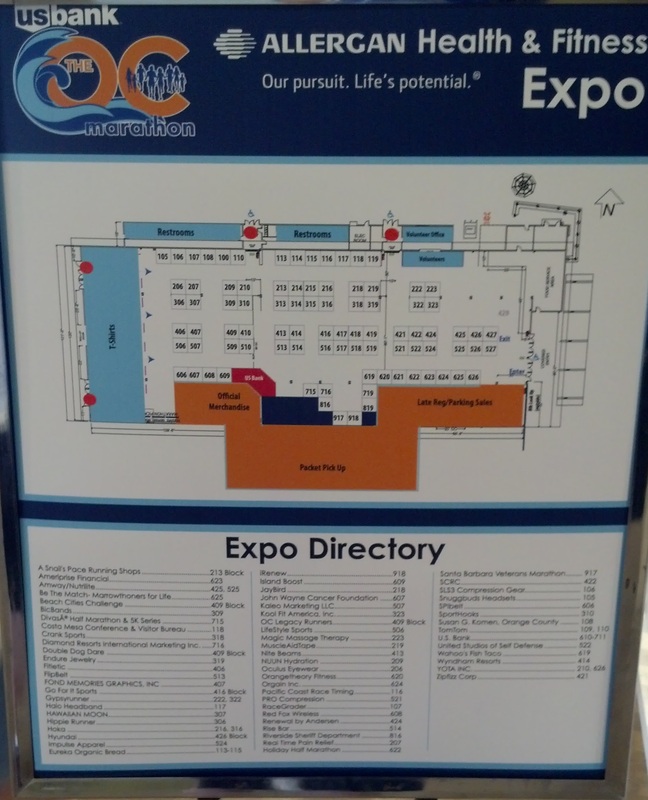 This was the only map of the Expo vendors that I saw this weekend. It wasn’t on the race web site. It wasn’t in anything we received prior to the expo. That was a little disappointing for me. This expo was larger than the expo for the Hollywood Half Marathon, but smaller than the expo for the Surf City USA Marathon/Half Marathon. I like that there was at least one map. However, it would have been better if there were more so I could have known what to expect before. I did like this backdrop for you to get a picture with! My wife was awesome enough to snap this picture of me with my race bib. 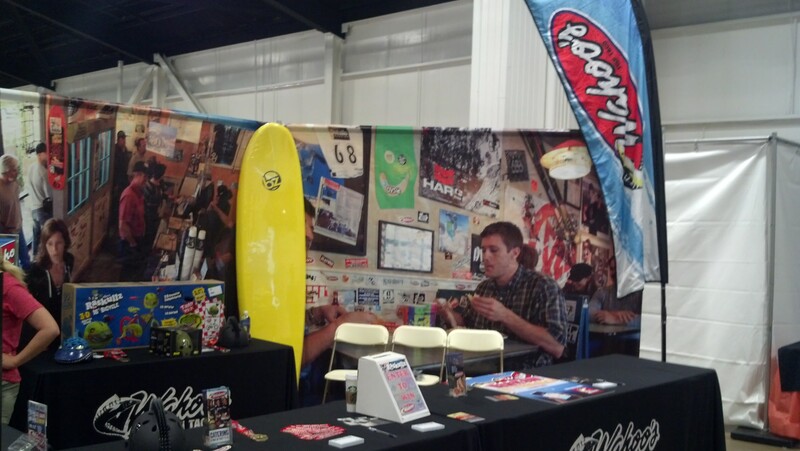 Wahoo’s is not your ordinary race expo vendor. 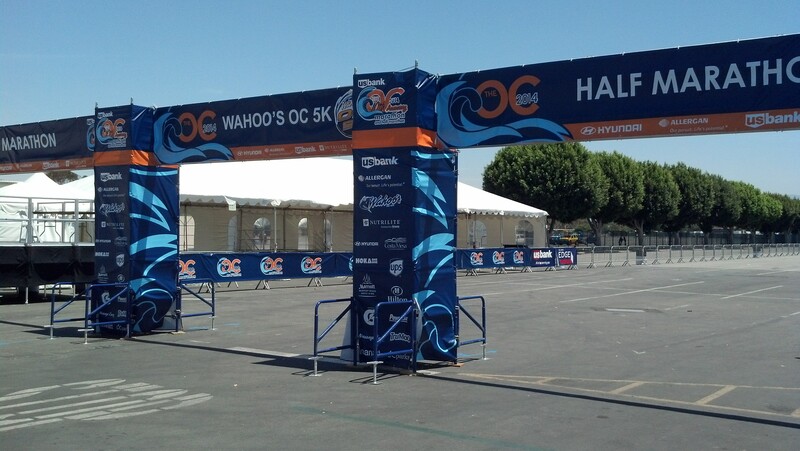 However, with Wahoo’s being the sponsor of the 5K race, they set up shop at the expo as well. 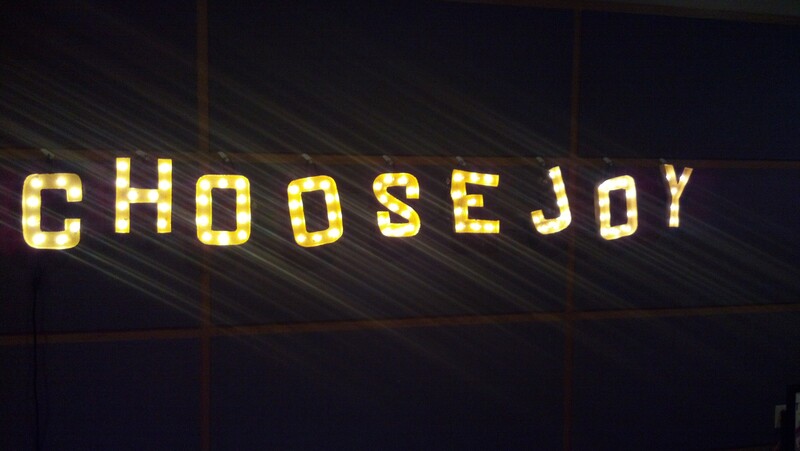 Before leaving, I saw this booth. This is an interesting idea that I saw in one of the emails from the race organizers. 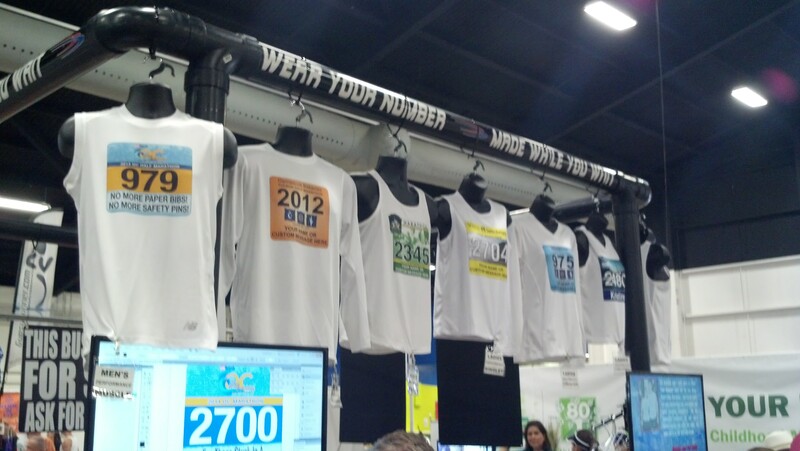 Apparently, this company will print tech shirts with your race bib on it. The folks at the OC Marathon and Half Marathon would allow you to wear this shirt without attaching a separate bib number on it. 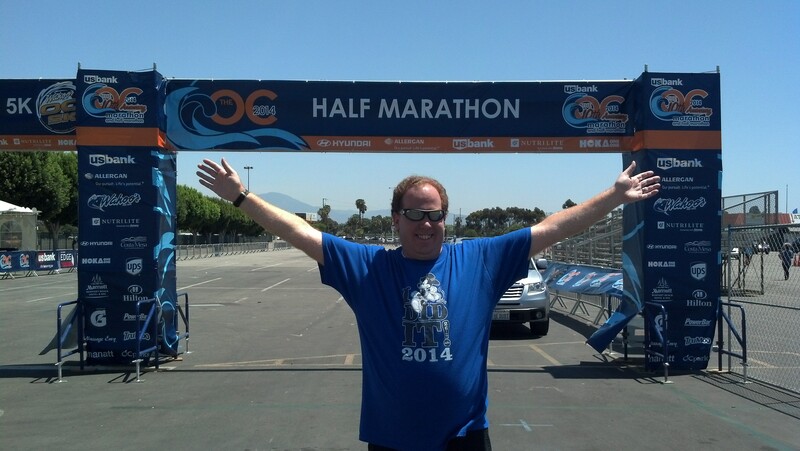 The OC Half Marathon wasn’t a race that I was super excited about going into it. So, this idea for this race didn’t appeal to me. However, I did see a few people on the race course the next day sporting these shirts. For me, it wasn’t appealing because, outside of the race itself, when would I actually want to wear a shirt with a race bib on it? 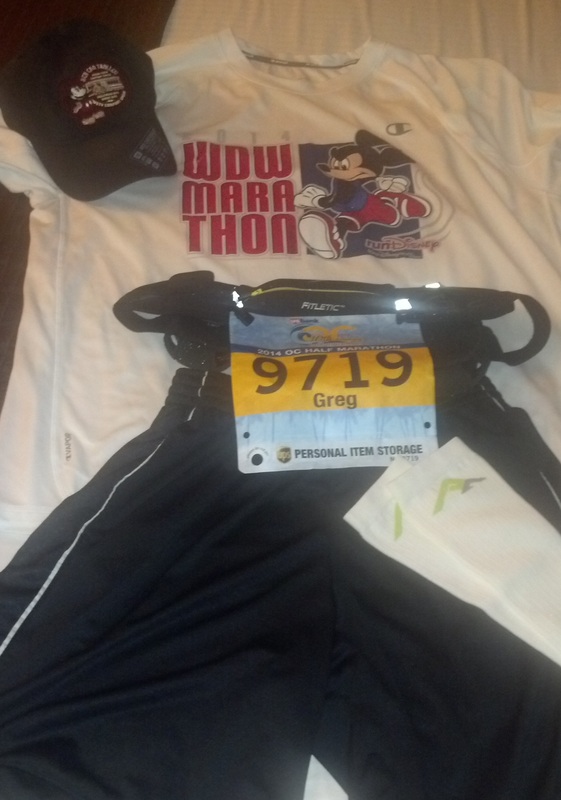 Now, if the folks at runDisney, with their well designed race bibs, offered this, I might have to seriously think about it. On the way back out to the car, I took a few pictures of things that were set up for race day. 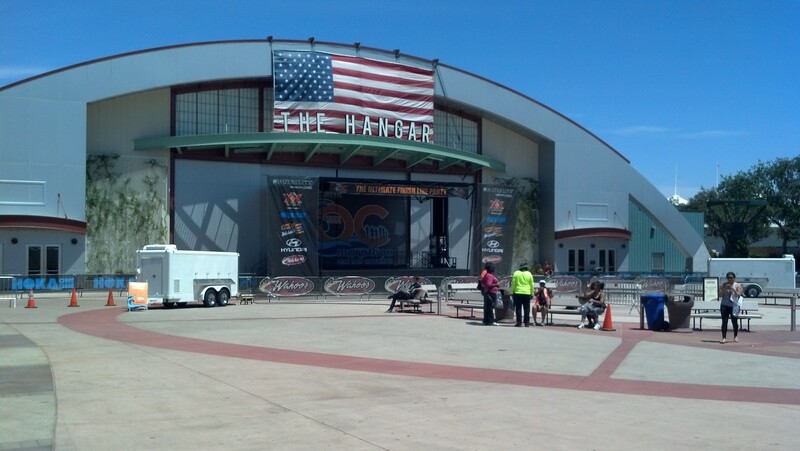 This is the main stage where they would have live music after the race. 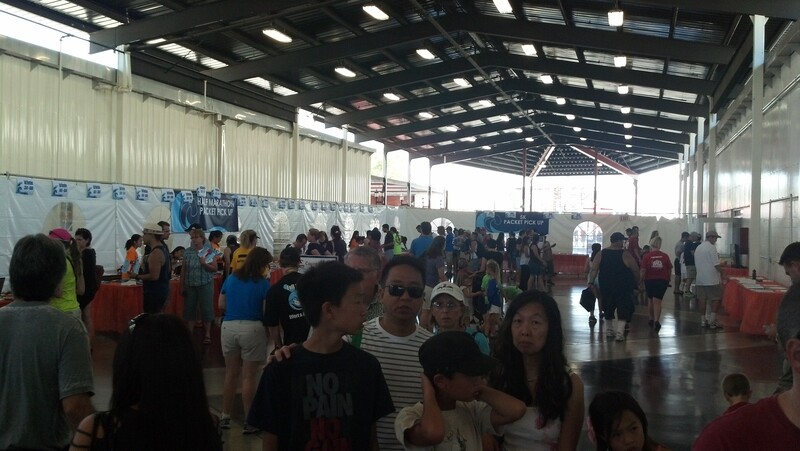 While the sign was for race day, down this area was where they were giving out the race bibs at the expo. The finish line was all set up. Finished! One day early too! If only I was this happy at the end of the half marathon the next day. I thought it was interesting that they had 3 separate finish lines ready to go. When I saw this, I wondered if I’d get my choice of where to finish. They had the separate areas and enforced those areas the next day. It worked out organizationally. They had the people presenting the finisher medals lined up behind each finish area. So, it made it easy on the volunteers to give us the correct finisher medal. With the Choose Joy Event for us to get to by 2pm, Brooke and I ended our brief time at the Allergen Health & Fitness Expo after about an hour. It was a hot day and we still needed to get some lunch. I must say in closing, though, the ease in getting into the expo was not there getting out of it. There are two traffic lights to clear once we left the parking lot before we got to the freeway. It took nearly a half hour to get to the freeway. I think I could have run to the freeway and made it to the entrance faster. After the Choose Joy Event, we made our way to the Ramada Costa Mesa (one of the host hotels) to catch some sleep before the races. I laid out “flat Greg” and called it a night. 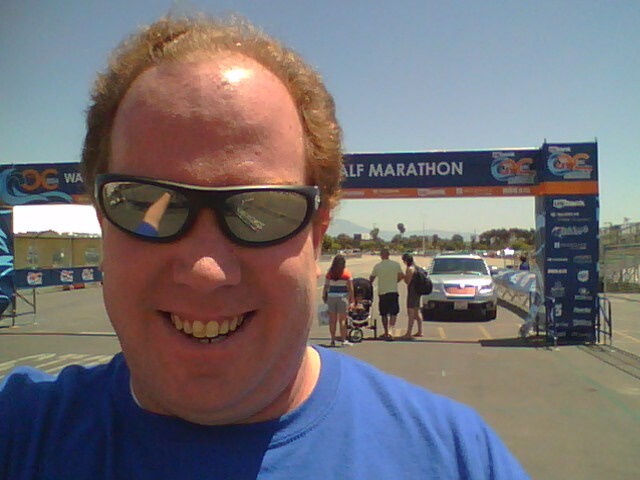 Tomorrow, I’ll get to my recap of the 2014 US Bank OC Half Marathon.